If you are containing hazardous liquids using a primary containment liner, you are required to provide an added layer of security with a secondary containment liner. Fab-Seal Industrial Liners, Inc. is capable of providing a secondary containment liner that can act as a failsafe in the event that the primary containment layer should fail. A secondary containment liner helps prevent environmental issues that could arise if a primary containment liner fails and hazardous material is exposed. Most primary containment liners last up to 10 to 15 years after initial installation, so when they do fail, its important to have a secondary containment liner in place. If you would like to find out more about the uses and benefits of a secondary containment liner, please call the industry professionals at Fab-Seal Industrial Liners, Inc. at 1-800-874-0166. You can also get in touch with one of our knowledgeable representatives with any questions you have by filling out the online request form on this page. Fab-Seal Industrial Liners, Inc. is an OSHA compliant team to take care of the secondary containment liner installations to ensure that the process is completed up to code. Our experts can install a secondary containment liner in a matter of days. Our team works with a sense of urgency because we realize that your time is valuable. 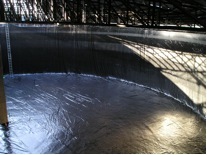 Most secondary containment liners can be installed within a week or less depending on the size. Fab-Seal Industrial Liners, Inc. has 30 years of experience in providing premium work on your secondary containment liner installation. At Fab-Seal Industrial Liners, Inc., no tank is too big or too small for our secondary containment liner installation services. 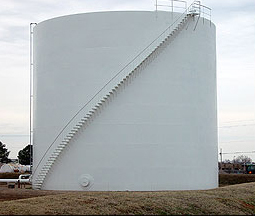 We are capable of creating custom secondary containment liners to fit any tank shape or size that our customers require. All of our secondary containment liners are made of premium quality material to withstand hazardous and corrosive acids and alkalis. For more information on how you can get started with a secondary containment liner installation, call the industry professionals at Fab-Seal Industrial Liners, Inc. today at 1-800-874-0166. You can also reach out to one of our knowledgeable professionals by simply filling out the form on this page.